The Korean Progressive Network (Jinbonet), the Korean National Commission for UNESCO, PeaceNet, the Korea Information Society Development Institute, Korean Labor Net (NodongNet), Citizen’s Action Network and other CSOs took part in the conference. Members from each organization discussed how to participate in the WSIS. The United Nations will hold two more WSIS meetings in 2003 and 2005. The Preparatory Committee (Prepcom) and regional conferences have already preceded the main event. Civic and social groups can participate in the WSIS because the WSIS is a partnership between government, business, and CSOs. But the participation of CSOs may not be as easy as people realize. Many experts expect the WSIS to announce an information society agenda, and this will effect information and communication policies, internet communities, and entire economies. “CSO participation in international conference such as those organized by the U.N. is very popular these days. In particular, CSOs can call attention to human rights and interests among conflicting agendas between countries. This is a positive role for CSOs.” He added that though the Geneva WSIS will be held in 2003, the detailed process of preparations for the WSIS have been going on since this past July. Therefore, CSOs should more actively join online discussions. Mr. Chun insisted that all people who are involved in the interests of information society should be able to join the WSIS in order to establish a new framework that extends beyond the partnership of government, business, and CSOs, and the WSIS should be able to deal with all issues regarding an information society. 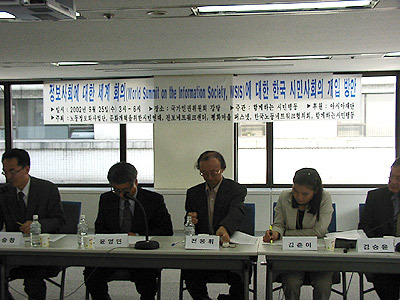 Oh Byung-il of Jinbonet said, “The WSIS will determine the fundamental issues of information society. In this process, people should use caution against logic focused on industrialization.” In other words, this means that the discussion should be focused on human rights on the internet, not capitalist benefits. UNESCO is now preparing a conference to assess the opinions and attitudes of civic groups. Debate of these issues will be the basis for fundamental reflection of an information society. How to make these thoughts part of a global discussion is the next challenge. Today’s conference signals that Korean CSOs have earnestly started the discussion on the WSIS.